Video game design studios can be applied to other areas such as education, health, tourism or culture. It is a sector of great route and not only destined to the leisure industry. Half of the Spanish companies consider having difficulties to find profiles with adequate training in the market, due to the lack of specialization. This is your chance. The videogame is an industry that requires highly specialized personnel, of which 64% have completed higher education and 33% have medium studies (higher FP). Currently, there are more than 10,000 professionals in Spain linked to the sector directly and indirectly. As of 2018, the business models associated with eSports and the contents for Virtual Reality and Augmented Reality are positioned as a great opportunity. Have an overview of the industry, its creation process and the actors involved in this process. Address the process of creating and modeling a 3D design and master the development tools. Understand the phases of the design and development of a video game. Design characters and virtual scenarios from the creation of the first character sketches to the development of animated sequences. ESCO is a center attached to the University of Wales Trinity Saint David, which issues the European university degrees. (240 ECTS). The studies have an official character throughout the European Higher Education Area. Start to practice from the first course. More than 250 agreements signed with Communication and Marketing companies. Professors from academia and the company, active professionals who will put you in touch with today's work reality. Do not stay without studying at ESCO for economic reasons. If you have a vocation we want you to be here. We help you through Fundación ESCO. What outputs does this degree have? 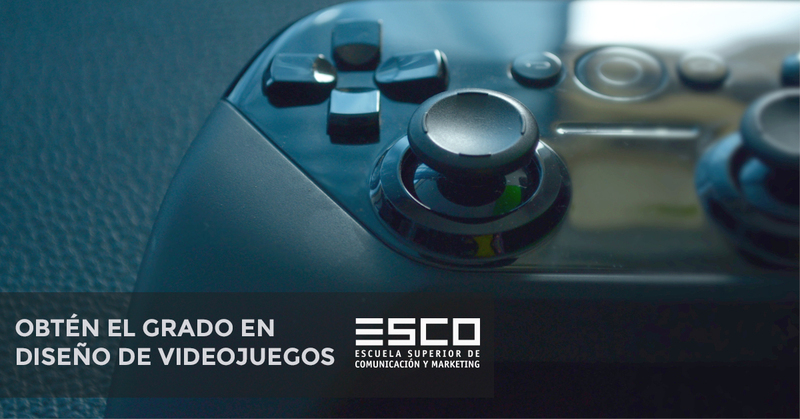 With this degree you can dedicate professionally to different companies that require resources of journalism, advertising or marketing because in ESCO we have a branch during the course where you can take common subjects between grades. What if I have not approved selectivity? Do not worry, the test of selectivity opens more possibilities but you can study the Degree without a PEBAU. We do not have a cut note. We value your vocation, talent, knowledge and attitude through an internal test and a personal interview. At ESCO we have an appropriate program for each grade level in which you can take different courses since among the different courses you can share knowledge from other grades.